Living Libations Frankincense Fresh Toothpaste is a brilliantly alkalinizing paste for smooth, shiny teeth and the freshest breath. Apply a small pearl size to a dry toothbrush and brush. Pearly, clean teeth, fresh-all-day breath, and sweet saliva await you. Sacred frankincense and myrrh meld with alkaline sodium bicarbonate to sweeten and support your oral ecology by neutralizing acidic saliva and banishing bad breath bacteria. They combine with the truth-telling essences of gentle, sweet thyme, zippy peppermint, and plaque-preventing tea tree for a shiny, white smile. Use as you would toothpaste. Apply a small pearl to a dry toothbrush and brush. Combine with Happy Gum Drops, Yogi Tooth Serum or Mint + Myrrh Serum for a boost. Follow the 8 Steps to Successful Oral Care. Cocos nucifera (Virgin Coconut), Sodium Bicarbonate, Saponified Olea europaea (Olive) Oil, Boswellia carterii (Frankincense), Commiphora myrrha (Myrrh), Mentha peperita (Peppermint), Thymus vulgaris linalool (Sweet Thyme), Melaleuca alternifolia (Tea Tree), and MSM. Virgin Coconut (Cocos nucifera) Oil – This diverse lip is a caring carrier oil and botanical biotic coconspirator that balances oral ecology. This optimal oil soothes the oral tissue and gently removes bacteria that cause bad breath. Frankincense (Boswellia carteri) Essential Oil – A liquid pearl of holy anointing oil from the tree of life, our Frankincense comes from Somaliland where they grow the highest quality of gum trees. This precious essence has been used to support clean teeth and fresh breath for thousands of years in Middle Eastern areas. It is common for Arabian people to chew the resin in their mouths. They know of its ability to eliminate bad breath causing bacteria and assist with removing plaque. Myrrh (Commiphora myrrha) Essential Oil – Myrrh is one of the oldest botanicals in the world. It has been mentioned in Egyptian texts including the Ebers Papyrus, which documents over eight hundred formulas. The Egyptians used large amounts of myrrh in rituals, remedies, cosmetics, and embalming. Myrrh’s oral history includes it being used as a soothing, calming essence for the mouth. Peppermint (Mentha piperita) Essential Oil – Peppermint’s cool breezy taste gives you long-lasting fresh breath. Our peppermint is a genuine distillation of the fresh leaves and comes from a fourth generation family of distillers in France. The peppermint in commercial toothpaste is artificial menthol and only offers flavor. Real peppermint is a potent and pleasant friend for oral care. It also inhibits the bacteria that cause bad breath. Tea Tree (Malaleuca alternifolia) Essential Oil – Traditional tea tree is an herbaceous Herculean do-all. It is naturally packed with magnificent mouth attendants. Potent plant compounds of cineole and propanol work to refresh the mouth, prevent tartar build-up, and banish the bacteria that cause bad breath. Steam distilled in Australia, Tea Tree oil evokes a super-clean, piney-clean aroma. Sweet Thyme (Thymus officinalis linalool) Essential Oil – This is a rare variety of the thyme species. It is a gentle toner that balances oral secretions. Thyme Linalool is also a potent botanicalbiotic that banishes bad breath bacteria. THE BEST NATURAL TOOTHPASTE I’VE EVER USED. 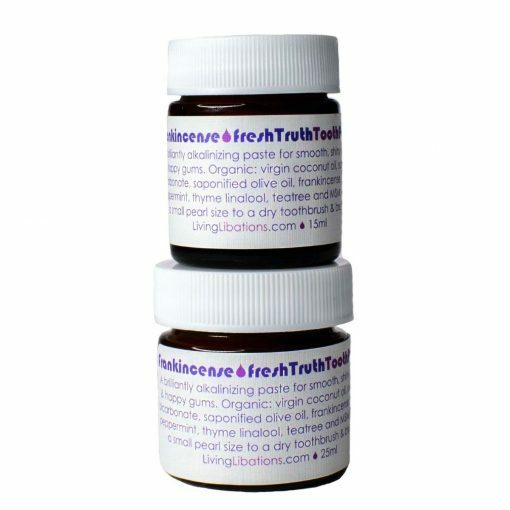 The Frankincense Fresh Truth Toothpaste is the best natural toothpaste I’ve ever used. It does take a little getting used to because it’s not like regular toothpaste. You use a small amount on a dry tooth brush, and even though it doesn’t foam up – it cleans your teeth and mouth thoroughly and freshens your breath. Nothing I have used compares to it (and I’ve tried a lot of natural toothpastes, and none of them clean my teeth or mouth properly like this one does). I just started using your Frankincense toothpaste and it is divine! I’m pretty sure it’s starting to reduce some of my tooth sensitivity. Fresh fruity uplifting and so clean! I love the way my teeth look and feel after polishing with this beautiful paste. My teeth are whiter for sure. My ALL TIME FAVORITE..I keep ordering this again and again and soon will order my new pot of this miracle. I have suffered years from many teeth problems. Tooth decay, root canals, teeth that easily break, bad breath etc…this is my only way to go..and if you try this, there is not a coming back. No other product has saved my teeth and mouth like this blend did. ? This toothpaste is amazing. I use it every day, sometimes with a drop of happy gum drops serum. Makes a big difference in my oral care. Teeth feel so clean after.